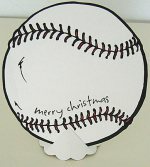 This black Christmas card is very easy and quick to make. 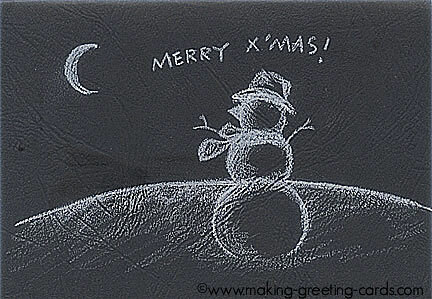 Black and white Christmas greeting cards are trendy and quite popular among the young people. 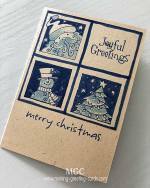 If you find that you lack time to make all your cards, this black colour Christmas greeting card design might be the answer. For this holiday card, you don't even need any rubber stamps or clipart image. All you need are black cardstock and a white color pencil. Here is the card I created. Have a look and see whether you like it or not. The snowman is very easy to draw. Just draw three circles; a small circle for the head of the snowman and one medium circle with a larger one for the torso. Add the carrot nose and some twigs for the arms and hands. A winter scarf and you have your adorable snowman. And don't forget to place a hat on the top of the smallest circle. Add a crescent moon and draw a curve line just across the middle of the torso. Finally, write Merry X'Mas, short for Merry Christmas above the snowman. That's it. And your black Christmas greeting card is all ready to be slipped into an envelope and sent out. Hope you like this Christmas card idea. Note: Add a Christmas quote or Christmas card verse inside the card. Use white gel pen or the same white colour pencil to write your message. 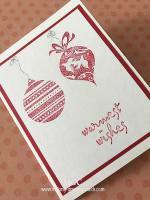 Another way is to add a piece of vellum inside the card for the Christmas greetings. And do remember to bookmark this website as I will be adding more examples of these homemade greeting cards. Clean clear stamp immediately with dish washing detergent after use. For stubborn stain, use a dish cloth to rub off the ink stains. Use clear embossing powder on colored stamped images. If you missed any stray powder, it's not noticeble. 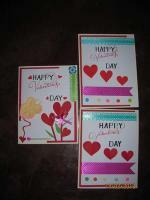 Click here to read more card making tips.